The Ghost Busters (1975): The One with the Monkey – AiPT! I know I’m not the only kid who looked in the TV Weekly that came with every Sunday newspaper, saw Ghostbusters on the schedule, assumed it was The Real Ghostbusters, got hyped, and then felt the crushing blow of disappointment when it turned out to be “the one with the monkey”. You know, the Other Ghostbusters: The s----y cartoon from Filmation that came out at the same time as the better Ghostbusters cartoon based on the films from Columbia Pictures. As a kid, I didn’t really question where the crappy “fake Ghostbusters cartoon” came from, I just knew that I hated it. Decades later, I learned that it was a sequel to an even worse live-action TV series, parsed The Ghost Busters, which aired for 15 episodes in 1975. Here’s the theme song, if you’re anxious for a taste. I since became a little curious about it, despite the mixture of apathy and rage from my youth. I mean, I knew it would be bad, I just kinda sorta wanted to know HOW bad. And brother, is it bad. 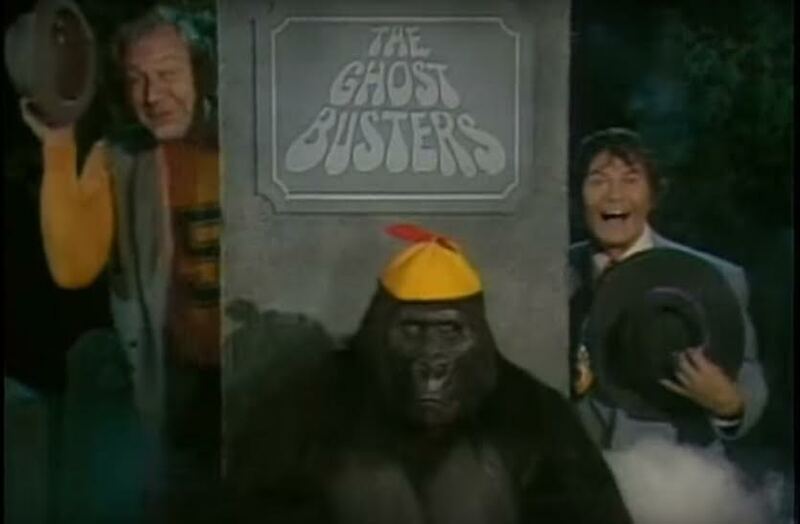 The premise is as follows: Spencer (Larry Storch), Kong (Forrest Tucker) and their gorilla assistant Tracy (Bob Burns) are the Ghost Busters, a detective agency that solves ghost-related cases. Except they don’t actually function as a detective agency, but rather receive their assignments directly from a mysterious individual named Zero (voiced by Lou Scheimer), who inevitably sends them to the same castle every week to deal with a special guest star who has escaped from “the great beyond”. My thoughts precisely, Spongebob Squarepants. Now, let’s talk about Filmation for a second. I know that a lot of folks out there have a warm place in their hearts for the company, and I’ll cop to enjoying the Groovy Goolies. I’m not made of stone. But man, did they know how to cut corners. Filmation’s cartoons were infamous for their ability to reuse assets, and much to my astonishment, their live-action TV shows were just as good at it. Every episode of The Ghost Busters was written by Marc Richardson, and every episode follows an identical pattern… An identical pattern that inevitably leads the cast to the same 3 sets and 1 location. And ONLY those 3 sets and 1 location. So every episode opens with the ghost of a historical or literary figure (the Red Baron, Merlin, Billy the Kid, etc.) manifesting in a cardboard cemetery (SET NUMBER 1) alongside their comedy relief sidekick (and EVERY ghost of the week has a comedy relief sidekick, and in at least two episodes, the same comedy relief sidekick is reused with different lead ghosts). They’ll then take up residence in the same nearby castle (SET NUMBER 2) from which they will plot their evil scheme. Enter the office of the Ghost Busters (SET NUMBER 3). Spencer (spelled that way in the credits, but “Spenser” on the door to their office, so I don’t know which one is “right”), Kong and Tracy will be engaging in some shtick until Kong finally tells his two idiot cohorts to go get their next ghostbusting assignment. Through the power of stock footage, Spencer and Tracy will drive the Ghost Buggy down to the general store (LOCATION NUMBER 1 and also ONLY LOCATION) where Tracy will fetch an object with a recording hidden in it. Zero will tell them about the ghost of the week, maybe offer a clue as to how to beat them, and then the tape will explode in Tracy’s face. The Ghost Busters will then meet the ghosts either at the cemetery (where they’ll always go unprepared) or at their office. The ghosts will escape and Kong will order Spencer to get a file on the ghosts from their haunted filing cabinet. The cabinet has a mind of its own, so Spencer can’t open it. This joke is also replayed with stock footage on multiple occasions because “Filmation” and I don’t need to explain any further. They’ll eventually go to the castle, hijinks will ensue and in the end the ghosts will be vanquished back to “the great beyond” via the dematerializer; a projector device with an undisclosed origin. The Ghost Busters will return to their office for a bad joke and then roll the sweet, merciful credits. Alright, if you were able to picture all of that in your mind’s eye then CONGRATULATIONS! You just watched all 15 episodes of The Ghost Busters. And in considerably less time than it took me. Now, lots of shows are repetitive and follow a rigid formula, but I’ve never seen a show adhere to a bulleted to-do list as strictly as The Ghost Busters. You can set your f----n’ watch by this show. The tone of the series is absurdist, often resorting to goofy, impossible gags (like a bus picking up Tracy in the middle of the Ghost Busters’ office). Believe it or not, but this live-action series is markedly more cartoonish than the 1986 incarnation, which was an *actual* cartoon. Let that sink in. The gags are a lot of vaudeville pie-in-the-face and slipping-on-banana-peels stuff. It thrives on dumb puns and shtick that was decrepit by 1975, let alone 2016. If there’s any upside to it all, I’d have to say that the cast is astonishingly good. Forrest Tucker and Larry Storch, who had previously starred together on F Troop, don’t phone in a minute of this series and put in a lot of physical comedy. They yuck it up and mug the camera and try to infuse some energy into the lifeless plots and it’s worth it to watch just for them. While Tucker’s Kong is the no-nonsense leader, he isn’t really a straight man and gets to engage in a lot of the silly antics. Storch’s Spencer gets most of the “best” material and he looks like he’s having a ball. Evidently, The Ghost Busters was more fun to star in than to watch. Bob Burns plays Tracy the gorilla and he does a good job so far as people in monkey suits are concerned. Tracy isn’t the comedy relief idiot partner, but is usually shown to be more intelligent than at least Spencer and engages in new careers and crafts throughout the show. If you’ve heard of Bob Burns, it’s probably because you’re familiar with “Bob’s Basement”. He’s one of the most famous collectors of Hollywood memorabilia from classic sci-fi and horror movies and his notorious basement is more akin to a museum. I recall him having a segment on I think it was Sci-Fi Buzz on the Sci-Fi Channel in the early ‘90s, where he’d show off artifacts from his collection (like one of the last surviving King Kong armatures or the actual time machine from The Time Machine). What the f--k he was doing in that monkey suit, I have no idea. Each ghost of the week and their sidekick is played by a guest star. Don’t get too excited; this ain’t The Muppet Show. These aren’t big name guests by any stretch of the imagination, but you might be able to pinpoint some of them. And if you recognize them at all, it’ll be because you’ve heard their voice in a cartoon. For example, you’ve got Howard Morris (Wade Duck from Garfield and Friends), Joe E. Ross (Sarge from Hong Kong Phooey), Marty Ingels (Beegle Beagle from Grape Ape), Lennie Weinrib (Scrappy-Doo) and numerous others. I think the biggest star they actually got was Jim Backus, but even he was just as well known for voicing Mr. Magoo as he was for playing Thurston Howell on Gilligan’s Island. By now you’re probably asking: Is there ANY reason to watch the 1975 Ghost Busters series? It has nothing to do with the 1984 Ghostbusters film and its subsequent franchise; Columbia licensed the name and nothing else from the property. So you aren’t going to be seeing anything familiar in this show unless you’re a fan of the 1986 Filmation cartoon, which was a sequel (featuring the children of Spencer and Kong teaming up with Tracy to fight new stock footage). But c’mon now, what are the odds that you’re a fan of the 1986 Filmation Ghostbusters cartoon? Don’t be a contrarian, you know you aren’t. The formula will wear you down and all the energy from the primary cast can’t invigorate something so repetitive and tiresome. The guest stars aren’t going to floor you and at best they’ll elicit an “Oh, so THAT’S what the guy who played Sigmund from Sigmund and the Sea Monsters looked like” response. Admittedly, I always DID want to know what he looked like, so I guess I’m grateful. At most, I’ll recommend that you watch one episode. Because truth be told, once you’ve seen one episode, you’ve pretty much seen EVERY episode. You can only watch the cast of F Troop and a gorilla bumble around the same castle so many times before your brain turns to ectoplasm and oozes out your ears. Still, hey, at least I can finally say that I watched the original Ghost Busters series. So that’s a feather in my cap, I guess.